Although, I would be remiss not to include a small public service announcement here. I understand folks want to get the perfect shots of historical sights when they're traveling. Nobody gets that more than me. I'm the chick who totes around her massive camera in the hopes of capturing an inanimate object's life. Far be it from me to judge. However, when in a new place be aware of your surroundings. Don't stand in the middle of a parking garage entrance. When Alex and I pulled up to the garage we wanted to use, a massive tour group was blocking the entrance to the ramp. There were so many we weren't even sure we were at the entrance, because they blocked the whole ramp! C'mon people...common sense. If it weren't for another vehicle pulling up on the opposite side of the road and not-so-kindly nudging his way through the masses, we might have overlooked the garage and kept driving. Aside from the blocked car park incident, it seemed luck was with my group that day. There were empty spots right next to the exit to the garage on the first floor, free wash closets for us to use, and parts of a Christmas market still happening right outside the exit. I wasn't expecting to see any more of those this season, but you weren't going to hear me complain. It meant Alex was able to grab a bag of mandelns (sugared almonds) as we were leaving. 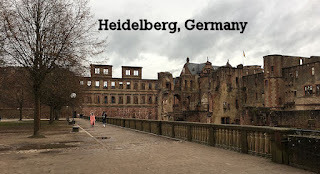 The focus of the day was visiting the ruins of Heidelberg Castle, set atop a hill overlooking the city. To get to the top, we bought a train ticket for 7 Euro per person that gave us access to everything but the interior of the schloss. The only way to go inside was to purchase a guided tour, and unfortunately Evie wasn't going to cooperate for the 60 minute duration so Alex and I skipped it this time around. It wasn't a total loss, though. The grounds covered a lot and provided multiple views of the exterior as well as views of the city and river below. While not as breathtaking as, say, Cochem, Heidelberg had a charm about it that was very inviting. I also loved how open the areas were, eliminating the claustrophobic feeling some of the castles can create when it's really crowded. As I mentioned earlier, the castle is no longer intact, with a lot of its roofs missing and its walls sporting gaping holes that showed off its wooden beams. Landon got a kick out of seeing its destruction, pointing to the red bricks and commenting on what was wrong. "...the most eloquent blend of the art of construction of the German Middles Ages, Renaissance and Baroque, look like a long line of crimson walls. There is no true uniformity here. The massive and imposing ruins roughly consist of a quadrilateral complex with round towers and a courtyard with buildings from various eras set around it. Gothic structures predominate in the western and southern parts, whereas the northern and eastern ones boast the tall magnificent walls of the Otto-Heinrichsbau, with a superb Italian facade decorated with caryatids," (Guadalupi, 133). Speaking of courtyards, our train tickets allowed us entry, and we were able to see a massive Christmas tree still adorning its yard. As well as allowing us to tour the German Apothecary Museum that resided on the property. It was an in-depth collection of tools and medicinal items used throughout the past 200 years. The recreations of old apothecaries were extremely detailed and informative. Since reading the Outlander series, I have a new respect and admiration for people who possessed the knowledge of herbs and plants and their pharmaceutical applications. Sure, I know lavender is relaxing and can help with headaches, but past that? Heck no. I would have been forced to suffer with joint pain or toothaches were I back in those times. Our ticket also gained us entry into a building housing the "famous Grosses Fass, a 55,000-gallon barrel made in 1751 from the wood of over 100 oak trees," (Guadalupi, 133). The tour of the courtyard ended at the balcony, where my group was able to get an undisturbed view of Heidelberg city. We stayed up there for a few minutes, then took the foot path back down to the bottom. We could have chosen to ride the train again, but the walk was closer and seemed quicker, and while that proved true the path was very steep and uneven. I would not recommend it to anyone in bad health or when it's icy/wet. During the drive, I had spotted a Starbucks on the GPS and wanted to see if they had a "You Are Here" mug depicting the city, so everyone took a stroll to the shop. We passed through the main street and got to see a beautiful cathedral, along with dozens of signature German buildings that gave the place such charming appeal. Both of my kids were whiny during the walk (despite both of them being carried) so I wasn't able to take any pictures from ground level, but believe me when I say that it was quite lovely. Even though the Starbucks did not have the mug, I wasn't upset at making the walk. It allowed me to see a little more of the city and embrace its beauty before we left. Hopefully, Alex and I will be able to return to Heidelberg and partake in the castle tour because I believe it would be worthwhile and enjoyable. If not, though, at least we can say we saw the ruins and stood in front of a 55,000 gallon barrel. Guadalupi, Gianni, and Gabriele Reina. Castles of the World. White Star, 2005. I applaud you for braving both Brussels and Cologne (and that trip you had kids) by yourself. I don't think I could have had the energy to fight those cities - free ticket to a planner convention or not. I am a reader from the Dis. I am in the middle of your current tr and got side tracked when you posted the link to your blog. I have now finished reading your entire blog and love it. I too am a fellow book lover and Outlander is one of my favorites series. Now I am headed over to the Dis to keep reading your tr. Hi Jessica! It's pretty neat to see a fellow DISer over here. I thought about forgoing this blog and including these day trips throughout my Disney trip reports, but now I'm glad I have them separated. Isn't Outlander a fantastic series? I am currently reading The Fiery Cross; it's proving to be a mammoth of a story, though. Hopefully, I'll be able to finish the rest of the series and be another impatient fan waiting on Book 9's release.